COLUMBIA COUNTY, FL – Looking to part Columbia County taxpayers with their money is nothing new for Florida's legendary premier good ole boy county, but the proposed $28,000,000 convention center, which is being pushed by outgoing County Commissioner Jody DuPree and his group of handpicked fellow committee members, may well be the biggest hair brained scheme in the history of North Central Florida. COLUMBIA COUNTY, FL – Last night the Columbia County Commission voted for the 6th year in a row to leave south end County residents paying outrageous fire insurance rates because it refuses to put a fire substation or contract with the City of High Springs to supply fire service in the far south end of the county. Last night, Columbia County's governing board met in regular session for the first time since the record three days of monsoon like rains began a little over a week ago, bringing national attention to this north central Florida county, dubbed by the state a "Rural Area of Critical Economic Concern." 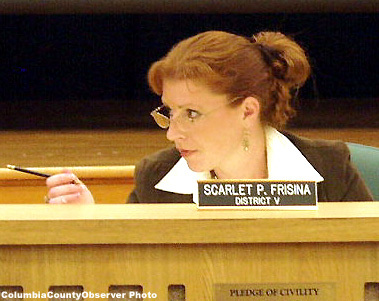 Board Chairwoman, Scarlet Frisina, sounded water logged herself, as she and the public listened to the reports of County personnel, and representatives from both the state and federal governments, however, it was the words of the public that had folks leaning forward in their seats. COLUMBIA COUNTY, FL – Columbia County's patrol deputies put their lives on the line every time they make a traffic stop or respond to a call. They are the police in green that the public knows up close and personal. Every day many of them make decisions that affect the lives and well-being of the public - decisions that are not reflected in their pay scale. COLUMBIA COUNTY, FL – Last night at the County Commission meeting, 34 year veteran School Board member Glen Hunter stood in front of the County Commission to convince them to assume the District's aquatic center. He came without any history of usage, maintenance or staff costs and never mentioned how much it cost to run the pool. In legendary Columbia County, this is business as usual. COLUMBIA COUNTY, FL – Tonight's Columbia County Commission docket is a doozy. Topping the bill is a little item on the consent agenda from the County's Utility Committee, the committee in charge of the Ellisville Utility Boondoggle. A little piece of land was overlooked when the County purchased the derelict sewer plant in Ellisville. The purported County Engineer, John Colson, sat in on those meetings and his company, Donald F. Lee and Associates should have done the surveys. The appraised value $159 – the offer $5,000. COLUMBIA COUNTY, FL – Columbia County and Lake City workers haven't had a raise in years. Tonight, hidden away in the County Commission Consent agenda, is a proposed change in the contract between Donald F. Lee & Associates, Inc. of Lake City and Columbia County. This contract has been in effect since 1991. It expired in 1992. Tonight Donald Lee is seeking raises for some its employees, swapping job titles with another, and creating a new position... Donald Lee has eliminated the position of Survey Technician and replaced it with a Senior Technician at an increase of 44% over the old position. Dist V Com Scarlet Frisina Breaks Tie: Votes to put residents on hook for $300,000 loan to Suwannee Valley Transit Authority. Collateral – what's that? COLUMBIA COUNTY, FL – Last night, at the Columbia County, County Commission meeting, residents laughed and snickered at Jack Berry protégé, District III Commissioner Jody DuPree, after he orchestrated a last minute agenda addition that went around in circles for an hour and a half. Residents were incredulous as County Attorney Marlin Feagle and County Manager Dale Williams couldn't come up with any SVTA collateral that could be used to secure the loan. Finally, Chairwoman Frisina ended the agony with her tie breaking vote. 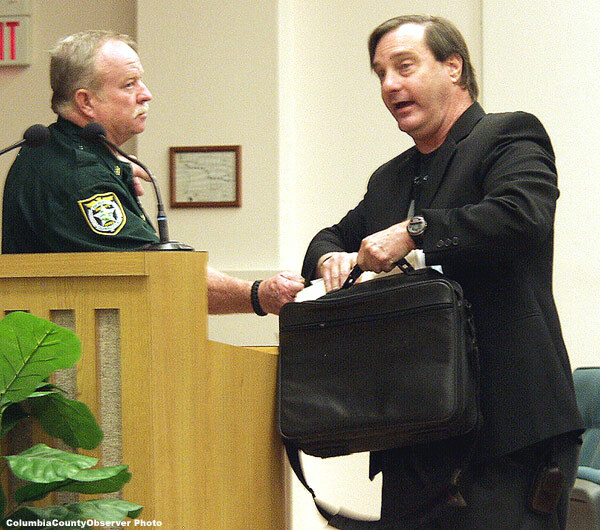 COLUMBIA COUNTY, FL – This past Thursday night, February 16, 2012, Columbia County Sheriff Mark Hunter once again spent his time at the evening's County Commission meeting sitting out of view in the shadows. In over three years as the County's chief law enforcement officer, he has worked to make himself invisible, rarely addressing the County Commission or the people that elected him and never speaking out against the pitiful pay of his patrol officers. This past Thursday was no different. 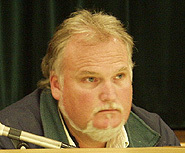 COLUMBIA COUNTY, FL – During the February 16, 2012 County Commission meeting, Commissioner Jody DuPree claimed that Sheriff Mark Hunter is "always tryin to figure out how to get raises for his people. So not at one moment has the Sheriff of Columbia County ever not tried to fight for his people... He has approached this board about that on many occasions." ¶ Not really. 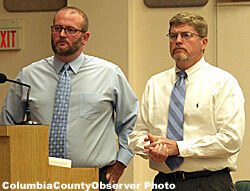 Columbia County's veteran IT Director, Todd Manning, tendered his resignation this past Wednesday, January 25, 2012. 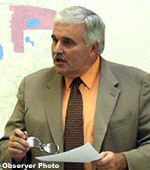 Mr. Manning was the man in charge as the County upgraded its computer network into the 21st century. The Suwannee River/St. Johns River Water Management Districts multi county/city working group picked up steam last night as it looked for a direction and method to keep a watchful eye on the region's water resources and the water management districts that by Florida Statute are entrusted to manage them. It was never explained by Columbia County, the facilitators of the event, why the water management districts were intentionally kept from updating the gathering on the joint progress being made by them, the DEP and the State of Georgia. These multijurisdictional issues are the very issues that the group was formed to address. Suwannee River Water Management District blown off Water Working Group agenda again: Was it an oversight or will they listen? 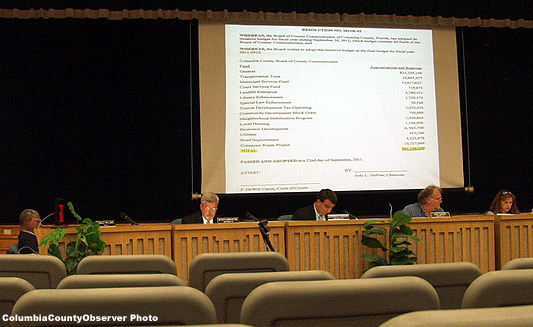 COLUMBIA COUNTY, FL– Last night, the Columbia County, County Commission spent millions in taxpayer dollars and is looking to borrow millions more for various projects throughout the County. The County Staff backed off from its recent practice of providing power point presentations, which provided clear graphical explanations of expenditures, and instead went back to the practice of a lot of talk, followed by slam dunk votes from the Commissioners. 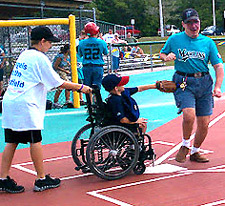 Columbia County – Will it build a Miracle Field where all the children can play? This past Tuesday evening the hundreds of people that traveled from as far away as Chiefland, Jacksonville and Keystone Heights and places in-between to come to Lake City for the tri county water powwow were denied the opportunity to hear the Executive Director of the Suwannee River Water Management District, David Still, and the Saint Johns Water Management District make presentations regarding the recent controversial water permit to JEA. Once again, Columbia County Florida's infamous good ol' boy County Commission did not disappoint, as it thumbed its collective nose at the County's 32,000 plus registered voters during its once every ten years redistricting deliberations. At every opportunity the County Commission made sure the public did not comment on the proposals. At times the public could not see the proposals. During the October 6, 2011 Columbia County Commission meeting, evil spirits once again took over Columbia County's infamous good ol' boy County Commission. Long time County Manager Dale Williams appointed a committee based on an event that never happened. He claimed in his Annual Report that facts determined by a committee formed by the Tourist Development Council (TDC) indicated possible revenue opportunities for the County should an "Events Center" be constructed. The facts, reported by the County Manager himself, at a TDC meeting indicated just the opposite. 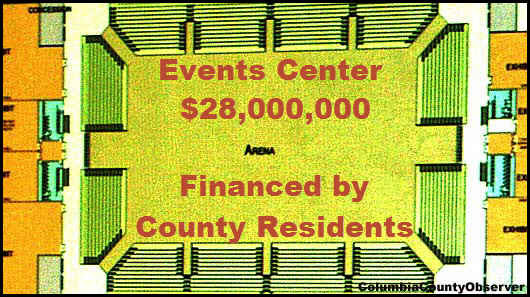 Any events center will have to be subsidized by the county's residents forever. 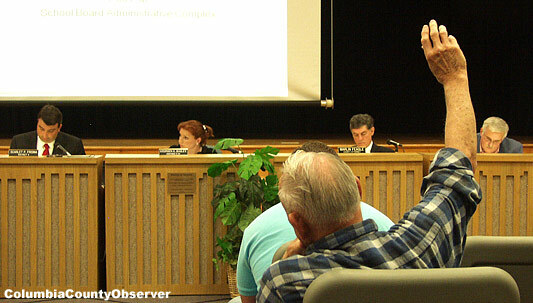 Thursday night, September 29, 2011, Columbia County's handpicked Charter Review Commission (CRC), met for its third meeting. Invited to come before the CRC were the five members of the County Commission. County Manager Dale Williams added himself to the agenda. The County Manager's urgent topic, removing the charter provision, that gives the public real time free and unfettered access to the same supporting information used by the County Commission and other County Boards at their public meetings. The Columbia County Commission as they are about to approve the 2012 budget. Chairman DuPree was the only commissioner who dressed down for the event, coming to the meeting in work boots, jeans and a dungaree shirt. Long time Commissioner, Ron Williams can be seen slouching in his chair way to the left. "I'd like to thank everybody for comin." Everyone visible in the photo works for the County except for the man seated in the front row. As County Manager Dale Williams, in dark jacket, presents the budget, the Board Chairman is headed to the side door. It is not clear if this was to answer his phone or to spit. Columbia County Florida's infamous County Commission once again buried its collective head in the sand last night when, without comment, except for a few misguided words from its chairman, District III's Jody DuPree, they once again passed a fire assessment routine that benefited the family of Dist IV Commissioner Stephen Bailey and many land developers and the rich, famous and well connected in the County. Columbia County vs. Florida Crown Workforce Board: Here we go again? Com DuPree Asks: Keep it open or shut it down? One week ago today, June 29, 2011, Columbia County’s department heads lined up like obedient little Indians and suffered through the last of the Commissioner DuPree imposed County Commission budget workshops. At least 95% of what the County Commission learned during the three months of meetings could have been learned by reading the different department's power point presentations, rather than having them read to them. The series of workshops served nothing more than to stroke the ego of County Commission Chairman DuPree, who asked 95% of the questions. Columbia County's infamous County Commission didn't disappoint last night when it approved an ordinance making County taxpayers subject to maintain roads in subdivisions with few or no homes. While many counties in Florida form special taxing districts, which require homeowners in subdivisions to pay for the maintenance of their own roads, Columbia County continues to subject all taxpayers to maintain the roads of the few. Columbia County privatizes EMS -- Com DePratter: It's "Economic Development." 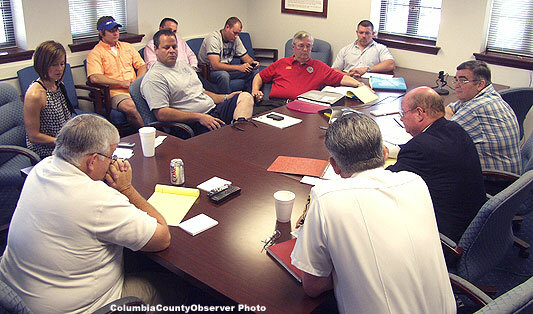 This past Thursday night, May 19, 2011, Columbia County's infamous and unprepared County Commission, while disregarding ongoing union negotiations and avoiding and discouraging input and participation from both the public and the County's EMS workers, took one hour and forty-five minutes to eliminate 20 years of loyal service and threw Columbia County's EMS first responders under the bus. 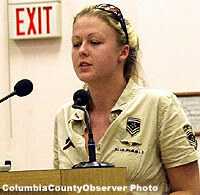 Columbia County Commissioner accuses citizen of "Plunderin around" his personal equipment. In Columbia County Florida, whenever one thinks the legendary good ol' boy County Commission has reached a new low, they pull a rabbit out of a hat, never disappoint, and outdo themselves. Last Thursday's County Commission meeting was no exception, unless one counts the meeting before or some of the ones before that. For the first time in six months, yesterday afternoon at 3 PM, the County EMS paramedics, represented by Lance Hill and the County, represented by outside council, Mike Grogan, faced off at the negotiating table. After a series of charges and counter charges, the sides got down to brass tacks. With budgetary woes facing county governments across the state and the nation, this past Thursday evening, the County Commission decided to fund Pop Warner football for 2010 and 2011 with old county money. After Pastor Alvin Baker's spirited appeal to the Commission, the Commissioners, without a scintilla of financial material from the requesting Richardson Community Center – Annie Mattox Park North, Inc., voted to give the group $10,000. Columbia County EMS -- What is it about no cost that the County does not get? For years, Columbia County's good ol' boys have intentionally been running EMS at a deficit. The County gave away the profitable side of the ambulance business. They were not straight with either Lake City or the County residents, never telling them that EMS could have been run at no cost to the County. Communities all over the country are supporting buy local campaigns. Last night, Ms.Val Leitner, the president of Blue Oven Kitchens, a nonprofit kitchen incubator serving the 10 county area of north-central Florida, addressed the Columbia County Commission and asked them to support a Buy Local campaign with a Re-Invest Day proclamation. She was turned down cold. After reading, Columbia County Commissioner's pool remains a death trap - State turns deaf ear, this article it has really opened up my eyes. While I was considering moving to northern Florida and after reading what goes on in Columbia County, I can honestly say Columbia County is not on my lists of best places to live, but rather sounds like a County to stay away from. ¶ ...you just may be saving an innocent person from a tragedy down the road. The Observer's recent coverage of the unfenced pool in Columbia County Commissioner Jody DuPree's yard has brought many comments, calls and communication with the Observer and the State. ¶ The office of newly elected Attorney General, Pam Bondi, advised in a boiler plate response to a local resident that... ¶ Gov Scott's office, while initially appearing to take an interest in this issue, has fallen silent. 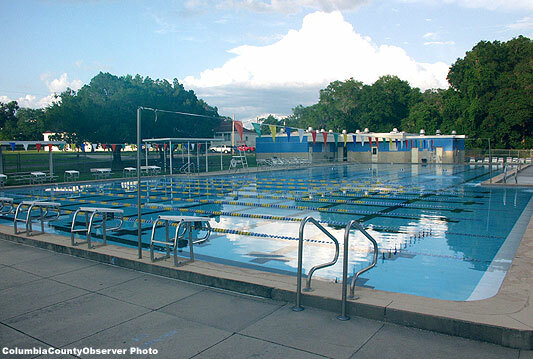 Florida has some of the toughest pool safety regulations in the world, for good reason. In the Sunshine State, "drowning is the leading cause of accidental death in and around the home for children under the age of five." If a child falls into your pool, because of Florida's attractive nuisance law, not having a fence around the pool is the same as leaving a loaded 47 Magnum on your front steps for a child to pick up. For the majority of folks, this would seem to make sense. For County Commissioner Jody DuPree and Columbia County Building Inspector, Harry Dicks, they seem to have other ideas. Even the innocuous gets swept under the carpet in Columbia County. One would think that even in the legendary Columbia County a presentation to the Water Management District would be public knowledge. This morning at 9 AM, County Manager Dale Williams is scheduled to make a presentation, on behalf of the County Commission to the Water Management District. The County wouldn't acknowledge this was going on until 04:10 pm yesterday afternoon. Yesterday morning Columbia County's EMS qualifications ranking committee met to rank the four responders to replace the County's EMS ambulance service. The four responders, in the order of their rankings were: Lifeguard Ambulance; Century Ambulance; Rural Metro Corporation; Columbia County EMS Association. The Columbia County EMS Association, the folks that have been providing EMS service to the county for twenty years, was considered nonresponsive. ¶ Mark Kazmerski, former County Commission candidate, EMS expert and flight medic said, ""Someone has an ax to grind with EMS. Someone on that board has an ax to grind." I am here tonight to speak on behalf of the Columbia County EMS Association, IAFF Local 3510. At the last board meeting this Commission unanimously voted to move towards the privatizing of this county’s EMS services. We are against this move. My purpose here tonight is to provide additional information for your consideration concerning your decision to privatize EMS. 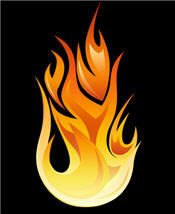 I am active on local, state and national EMS the councils. As business manager with a national air medical company my job is interacting with EMS and hospital management throughout a twelve county region in north east Florida. Mr. Grogan may be an experienced labor attorney, but an expert on EMS operations he is not. His statements two weeks ago were not only inaccurate, but key points concerning the issue were left out. While Florida Governor Rick Scott is looking to create jobs in Florida, the good ole boys of the Columbia County Commission are working to ship them to South Carolina. Up for approval on tonight's consent agenda is a contract with a company whose web presence is boiler plate mumbo jumbo and whose contract requires a virtual oath of secrecy for the county. In a county where the words – open, transparent, and accountable are like words of a foreign language, this would appear to be a perfect match. Columbia County, long thought by many to be the premier law breaking and corrupt county in Florida, has shown again that the concept of "reasonable notice" for public meetings - for the county's good ole boys - means no notice at all... Ms. Roberts has asked that the County Commission approve her and Com DuPree's recommendations at the February 15th Commission meeting, even though the recommendations were made out of the Sunshine. Last Thursday night, January 20th, Columbia County’s legendary good ole boys continued a tradition by awarding another monopoly to Century Ambulance. The Commissioners' mouths were zipped tight when this item came up for a vote. Once again, the Commission inflated the cost of ambulance service for anyone in Columbia County, giving them no choice but to use Century Ambulance for transport. A few months ago, Century Ambulance gave the County a gift worth, according to the County, $17,586. Economic Development the Columbia County Way, in their very own words. As Columbia County does its very best to mangle anything that resembles good government, County Commission Chairman, Jody DuPree, has now come up with a new scheme to keep the public in the dark, violate the County Charter, and most important for Mr. DuPree and the County Commission, keep from having to answer questions. ¶ Listen carefully, as 32 year veteran Commissioner Ronald Williams kicks off the conversation and delivers his three economic development talking points. Com DuPree decrees "No County participation"
At the Thursday, December 16th Columbia County Commission meeting, newly elected County Commission Chairman, Jody DuPree, decreed that County Commissioners will "no longer serve on any City [of] Lake City committees." Lake City is the County seat and known throughout Florida as the capitol of Columbia County. Com Stephen Bailey moved the appointments and non appointments and the rest of the Commission voted along in lockstep. Newly under the auspices of County Manager Dale Williams, the IDA has gotten worse. Now, the IDA is incapable of servicing its own web presence and it shows. Columbia County's good old boys slid $171,580 back to Sheriff Mark Hunter, who after being blown off at the November 4th County Commission meeting, was mysteriously absent from last Thursday's meeting.¶ The Sheriff has the most budgetary latitude of any Constitutional Officer and can move his money around virtually without oversight. 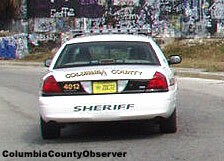 ¶ The $488,660 Sheriff Hunter claims to have spent on vehicles in 2009 appears to be an all time Columbia County record. Commissioner Weaver thanked the County Commission for their support of the library. Com Weaver explained that he came from a very poor family and that his first Library was the magazines his father borrowed from the barber shop. He explained his father was a reader. While the new Columbia County, Fort White Public Library is not quite ready for prime time, the Observer has learned that today - Friday, November 12, 2010, at 10am, there will be a private dedication ceremony in advance of the public dedication and grand opening... The Fort White Public Library is another County building designed for public assembly without an automatic fire suppression system. On Tuesday morning, October 26th, the County Utility Committee met, minus its Chairman, Commissioner Jody DuPree. Unlike in the rest of the civilized municipal world, where it is the practice of the Clerk to call the roll at the beginning of a meeting, Columbia County's good old boys skip over that formality in order that they may come up with a creative reason for someone's absence after the meeting. (photo - Com Scarlet Frasina). 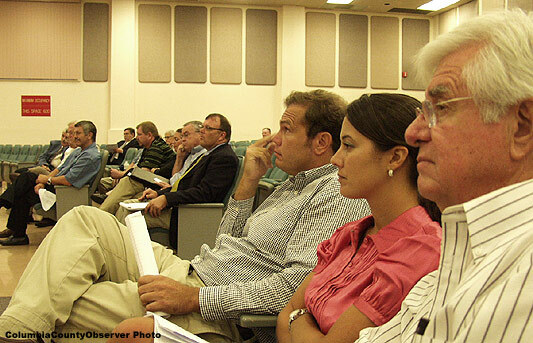 Members of the Columbia County Ida listen at the workshop. No one knew about the economic development ordinance that was passed in 2004. In the photo from left to right are Marc Vann, Carlton Jones, Gus Rentz, Suzanne Norris, Jeff Simmons and Gina Reynolds, who is the assist. director. Beginning in 2005 any person in Columbia County with a more than five acre homestead has been ripped off by the County Commission. The County continues to drag its feet on reviewing the fire rates for vacant land, while at the same time giving huge savings to the largest landowners in the county. 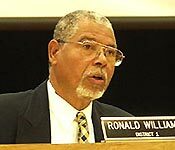 At Tuesday's July 20th Special Utility Meeting, County Commissioner Ronald Williams has once again set meeting decorum and common sense on its ear. 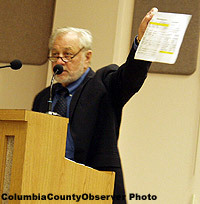 The legendary Williams, long known for his erratic behavior which runs the gamut from charming to rude... lived up to his billing at the County Commission Special meeting this past Tuesday night, demonstrating once again why many Columbia County citizens don't get involved in county meetings. Lake City out of compliance? Ronald Williams, the long time Columbia County District 1 commissioner announced during the Thursday, July 1st County Commission meeting that he is running for another term as county commissioner. At yesterday morning’s governmental focus group the Columbia County Commission was invited and chose not show up, not to send the County Manager or any other representative of the County government. The lack of County interest in the downtown of Lake City continues. The helter-skelter world of Columbia County continued at this past Thursday's County Commission meeting when the County Commission once again demonstrated that modern world finance, accountability and plain old common sense aren't even a dream of the legendary Columbia County Commission. Citizens Against Forced Utilities tell Columbia County "Don't tread on me." Dale Williams - "It is good government"
In November of 2006, your reporter presented the County Charter Review Committee (CRC) with an amendment to the County Charter called Enhanced Public Notice. The purpose of this amendment required the County Commission to post their agendas and associated backup material on the county web site... That November, the voters approved the amendment with an 82% majority... After a slow start, the county is up to speed and the Observer spoke with County Manager Dale Williams for his thoughts on this important piece of citizen approved legislation. The man in charge is Com Jody DuPree. A request that "touches the heart"
It was a sad day in Columbia County Thursday night... Com Williams' treatment of Com Scarlet Frisina was particularly disturbing, as he pointed his finger in her face, wouldn't allow her to talk and treated her more like one of his hunting dogs than a representative of the people. 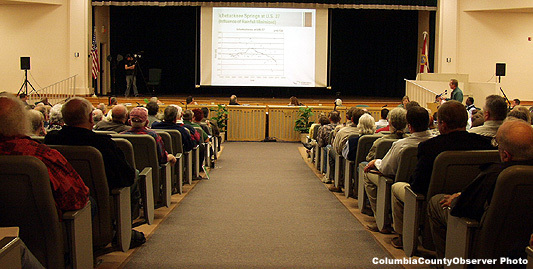 Finally - Columbia County has dueling rate studies. Planning - what's that? 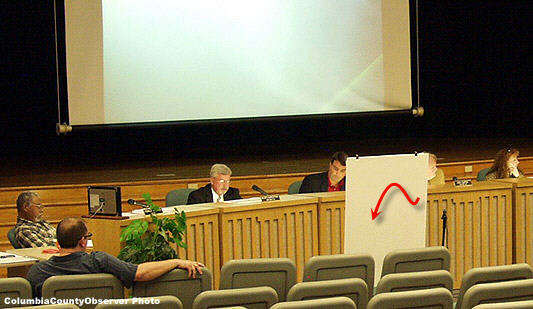 The Ellisville utility boondoggle continues as Jack Berry protégé, Dist. III Com Jody DuPree (right) has partnered with Com Ronald Williams (left) in closing out public comment and keeping the County Utility Rate Study under wraps for over a week. 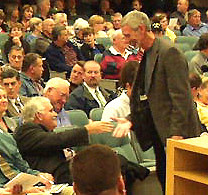 At the March 4, 2010 County Commission meeting, County Chairman, Ronald Williams, who has for years complained at every opportunity about the County's mistreatment by the City regarding the City's non contribution to EMS, joined with the top county management in collectively failing to prepare a complete agenda for the County Commission meeting, leaving off a very important item. At last night's Columbia County Commission meeting it was apparent once again that Columbia County is being left behind in the dust trails of yesteryear, as even the most simple forms of governance leave long time county commissioner and current Board Chairman, Ronald Williams, confused and unable to effectively govern, demonstrating once again that good government has no place in Columbia County. The Board's only African American member, Ronald Williams, a man who has for years watched rampant drug dealing in the hood and a declining school system, told the Board, "The Chair also agree with staff recommendation... Unless somebody got a golden goose to lay a golden egg... The library is the least thing that we have to worry about right now." Technologically challenged county weighs IT request for public funds for home use. I cannot think of a reason to justify this expenditure. At a time when the county has rolled-back the wages on their employees like Walmart having a sale, cut funding to publicly sponsored youth sports programs, cut back on library programs and moaned about budgetary woes, I find this request utterly distasteful and a potential complete waste of taxpayer money. Anyone could walk into the new Fort White library with a gun, a fight could break out, a car could careen through the front door, a child could be abducted and no one would be able to see it. Columbia County's "good ole boys" approved this plan digging in, never admitting a mistake. A Columbia County Commissioner, with benefits, makes about a thousand dollars a week. Some folks think that they have a right to know why their commissioners cannot attend a Board meeting. If three out of five weren't showing up, one would think the public has a right to know where their Commissioners are. Not in Columbia County.